Oh see - more 🔴🔴🔴! 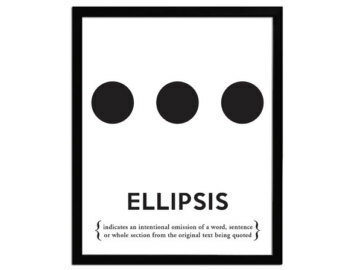 7) Ellipsis points are used to indicate faltering speech, especially if the faltering involves a long pause or a sentence that trails off or is intentionally left unfinished. Generally, no other terminal punctuation is used. The speaker seemed uncertain. "Well, that's true ... but even so ... I think we can do better." "Despite these uncertainties, we believe we can do it, but ...."
"I mean ..." he said, "like ... How?" 8) Ellipsis points are sometimes used informally as a stylistic device to catch a reader's attention, often replacing a dash or colon. They think that nothing can go wrong ... but it does. 9) In newspaper and magazine columns consisting of social notes, local events listings, or short items of celebrity news, ellipsis points often take the place of paragraphing to separate the items. Ellipsis points are similarly used in informal personal correspondence in place of periods or paragraphing. We'll be away for the weekend and then back to work Monday ... You're welcome to come for the graduation party at the end of the month. And there you have it. Now, go forth and with a new command of ellipsis points and a new sense of confidence when you need to collect your thoughts on the page ... may the 🔴🔴🔴 be with you!